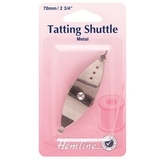 Hemline Metal Tatting Shuttle. Used to handcraft durable lace constructed by a series of knots and loops. Tatting can be used to make lace edging..
2 pieces per pack. The lightweight plastic Tatting Shuttle is very handy to use. It is very comfortable to hold when working the shuttles. The sharp point..
Clover Large Tatting Shuttle. 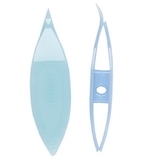 This easy knitting shape offers approximately 1.8 more thread capasity compared to other Clover Tatting Shuttles. 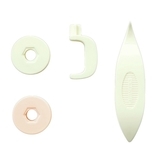 ..
Clover White Spare Bobbin Set. 5 spare bobbins with stopper, for exclusive use with Clover's bobbin tatting Shuttle (CL8105 or CL8106..
Clover Brown Spare Bobbin Set. 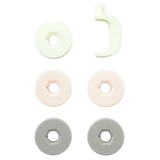 5 spare bobbins with stopper, for exclusive use with Clover's bobbin tatting Shuttle (CL8105 or CL8106..
Clover White Bobbin Tatting Shuttle. 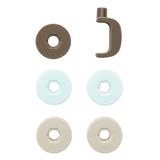 Easily change a tatting thread easily from a bobbin. 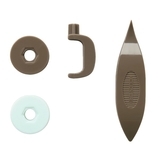 With convenient stopper to hold thread..
Clover Brown Bobbin Tatting Shuttle. 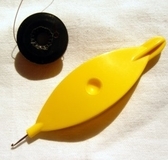 Easily change a tatting thread easily from a bobbin. With convenient stopper to hold thread..
"Hair Pin Lace" is a traditional interwoven braid that can be made using a basic technique known as "single crochet".Braids with a.. Storage Case For Bobbin Tatting Shuttle. 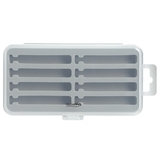 Exclusive case for Clover bobbin tatting shuttles and spare bobbins. Ideal for storing and carrying bobbins.. Storage Case For Tatting Shuttle. Exclusive case for Clover tatting shuttles. 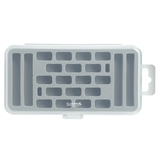 Ideal for storing and carrying shuttles. Easy to see the threads..
Tatting and lace making is a technique for handcrafting a lace from a series of knots. It is very important to choose proper thread before starting tatting and lace making. Lace gives a authentic and royal touch to any of the garment, dress or used in craft work, decorative pieces to enhance the beauty. 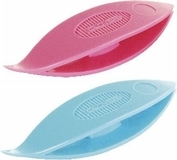 We have a variety of tatting shuttles which include metal tatting shuttle, plastic tatting shuttles in various colors. 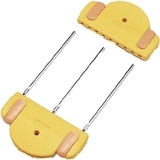 You can also check oour hair pin lace tool.